A series of bomb attacks across Iraq has killed at least 12 people, most of them Shia pilgrims, officials say. The worst incident was north of the capital, Baghdad, where two bombs, minutes apart, claimed the lives of at least seven pilgrims travelling to a shrine in the city of Samarra. Four more Shia pilgrims were killed in an attack in Hilla, south of Baghdad. 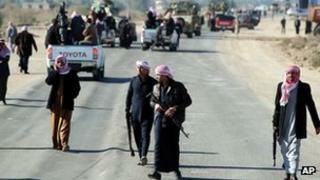 No-one has claimed responsibility but Sunni insurgents have been blamed for the recent violence in Iraq. Relations between the Sunni community and Shia-dominated government are becoming increasingly strained. Sunni activists have been staging demonstrations against what they believe is discriminatory treatment by the government. On Wednesday 42 people were killed in bombings - the deadliest day of the year so far. Also on Wednesday, hundreds of people attended the funeral of a Sunni MP, Eifan Saadoun al-Issawi, a prominent member of the Awakening Council, which has been seen as a key factor in reducing sectarian violence. Council members have often by targeted by Sunni militants linked to al-Qaeda.